i heard a story about a crocodile and a monkey.. There was a monkey that live all alone on an island on a rambutan tree. There is also a crocodile who stayed there also..
One day, while the monkey was eating the rambutan fruit he accidently drop the rambutan fruit and the rambutan fruit fell in the crocodile mouth..the crocodile mouth taste the rambutan and he love the rambutan very much..So, he thought of eating the monkey heart as the monkey always ate the fruit all day long and it should be nice he think. Then, the crocodile think of an idea how to get the monkey down..
One day, crocodile called the monkey. He said...Hey monkey..Are you happy there?You know what..there are many female monkey at the other side(river bank)..monkey said..it must be happy if i could get there but how would i reach there?i can't swim..
then, the crocodile said..i can swim you there..
Later, crocodile give the monkey a ride to the river bank. when they were in the water, crocodile lower down his body..why you so easily be cheated..I just want to eat your heart..
Ohh..poor you the monkey said.. 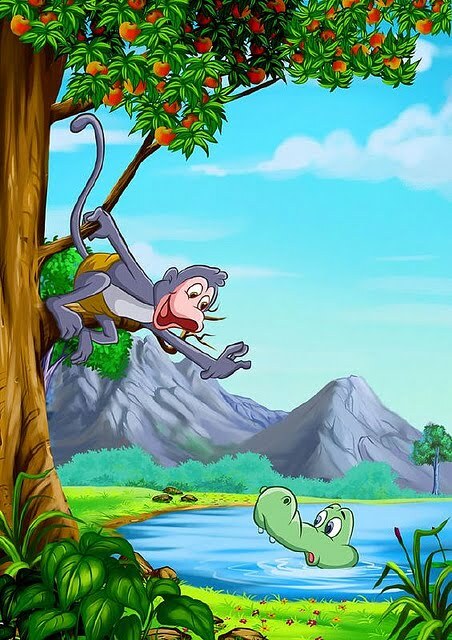 I have left my heart on the tree,why don't you said it earlier..
so, the croc take a u-turn..when they reach the island, the monkey quickly climbed up the tree and never get down..